Or not. It’s not like I’m running to be the next guy to attempt to sink the ship of state. No, I’m just submitting an entry in Linda G. Hill’s kinda-sorta-annual One-Liner Wednesday Badge Contest. I entered last year, too. I didn’t win. I didn’t win the popular vote or the Electoral College vote. I got a few votes, the winner didn’t win by a landslide wide margin bigly amount. But, he won, and I liked his badge. I have a ton of pictures of birds on this particular intersection of wires. Maddie and I pass them almost every Saturday, and they’re up there yammering up a storm. I’m not sure what birds talk about. Maybe good places to eat, good trees to nest in, that crazy red dog approaching, that guy with the camera, who knows. Anyway, I gathered a few of my favorites and I asked my daughter, Faith to pick one. In true Antion family fashion, she picked three and gave honorable mention to two more. We both liked the photo of the two birds with the fuzzy moon, but it didn’t work with “one line, many voices” which I wanted to include. 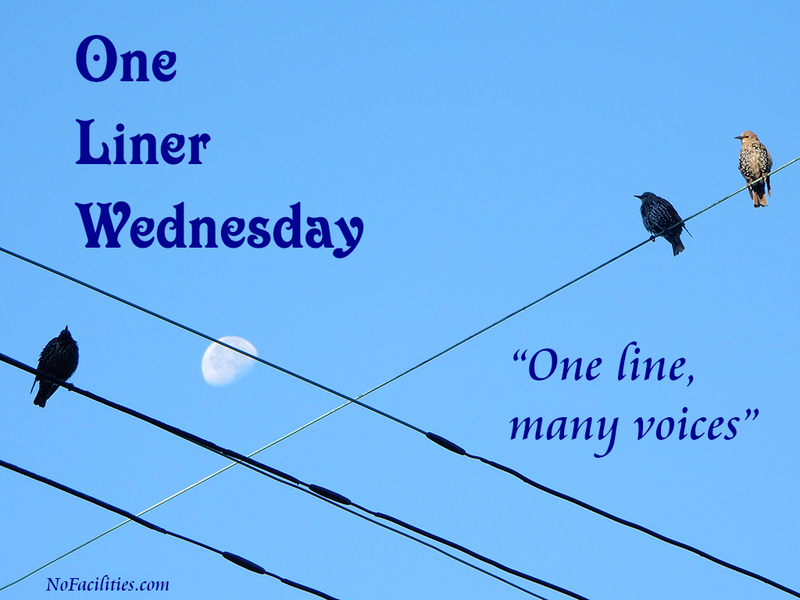 Two can’t be ‘many’ and “one line, a couple of voices” wouldn’t do justice to Linda’s weekly prompt. 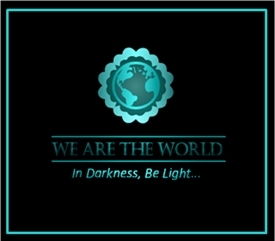 So, I stepped up, made the big decision, decided what to trim, where to crop, what font to use, and pushed save. Feel free to look in the gallery and tell me how bad a choice I made, but Linda only allows one entry per person, and I’ve made mine. May the best badge win. Regardless of whose badge you like, please vote and consider supporting One-Liner Wednesday. Linda brings us this super-fun way to share an interesting bit of conversation, a few words, song lyrics, all manner of stuff, each Wednesday. I enjoy the prompt, the challenge and I love reading the things the others come up with. Oh, and don’t be discouraged by the “one-line” thing. I’ve heard that some people exceed that limit…bigly. This just seemed to say “two lines” too much. Lots of stuff in this one. I like it, but might not be everyone’s choice. A little washed out. I could fix that, but every way I tried to crop this caused problems. This is close, but I discovered that I had one with the moon in it. Who can resist the moon? I like this photo, and I could crop/straighten, but still too much stuff. We both liked this one. I wish the moon had been bigger and the lamp smaller. Everybody seems to be on their own line, This might have worked, but it’s a gray day. LOL… I got a kick out of all the birds on “lines.” You got my vote, Dan. Have a sublime Sunday. Thanks Cheryl. Feel free to write that poem. You can steal the image or I’ll send you the full size version. I like them all. They made me think f the old party lines we used to have. Great photos, Dan. My vote is for you! Thanks Lois. You have to vote tomorrow on Linda’s page. It does make me think of the party lines. That’s a good reference. You chose well, Grasshopper! If I vote early, may I vote often? I couldn’t figure out where to vote. May not be available yet. I’m going to remind folks with a link tomorrow. I’m voting for you! How do we do that? I’ll post a link tomorrow. I think Linda will be using a poll on her site. Ha ha – I don’t have a full platform yet. Ha ha – thanks. And no, you can’t vote for Maddie – sorry. You’ll be getting my vote, Dan! Dan, scrolling backwards as I do on weekends isn’t so great when I find out sad or tragic things have happened to a dear friend. Just this past holidays you showed your Mom’s door and apartment building. . . Thanks Robin. Don’t worry. We all have lives and sometimes we miss stuff. It’s ok. I appreciate your kindness, and I appreciate your catching up with past posts. “One line, many voices.” Great phrase! Thanks. It’s like that every week. You have my vote too! But I can’t work out the how-to though…..
Dan you’ve got my vote. I just went to the site, but it’s not up yet to vote! Hope you win! Dan, I love your sense of humor. And writing style. Even if you don’t win this contest, I think I’ll stick around for awhile. Thanks. As long as people find something they like here, I’m a happy guy. Ha ha – I’m not supposed to play to the audience, but I do have some bird lovers – thanks! My vote is for you. I love the birds on the line. When I was little, I used to throw rocks at them for no reason at all. I feel so awful about that these days. I would miss all the time, but I would scare them off, denying them rest and time to groom. I also love how your transformers are small and compact. We still have the bulky ones. Thanks Peter. I try to keep Maddie quiet as we pass these guys. Now I feel better about sharing pictures of some sub-stations around here. At least someone besides me will enjoy looking at them. I liked your post on the contest. I hope that’s what you wanted us to do.